The Anglican Church of Saint Paul the Apostle was situated on the east side of Morice Square. It no longer exists. © National Monuments Record, (RCHM(E)). The ecclesiastical parish was formed on Thursday August 27th 1846* from the parish of Stoke Damerel. At first the congregation met in a temporary chapel in Navy Row**, Morice Town. The foundation stone was laid by the Mayor of Devonport, Mr John Beer Junior, on Wednesday July 25th 1849 after a similar ceremony at the Church of Saint James the Great. The Reverend J Adams officiated. Designed by Mr J Piers Saint Aubyn in the decorated pointed style of architecture, the Church was to have a nave and north and south aisles, the interior length coming to 63 feet 6 inches and the breadth, including the aisles, 62 feet. The windows were to have Bath stone dressings and at the western end was to be a tower surmounted by a spire 104 feet in height. The walls were to be mainly of rubble limestone. Accommodation was provided for 401 adults and 315 children. The contractors were Messrs Goodyear and Roberts, of East Stonehouse. Saint Paul's was consecrated on Tuesday April 22nd 1851. The original cost of the structure was £3,000. A mission hall was opened in Cornwall Street in 1883. The church was destroyed by enemy action in 1941 and services were held in the Anglican Church of Saint Aubyn during the 1950s, with which parish it was amalgamated. 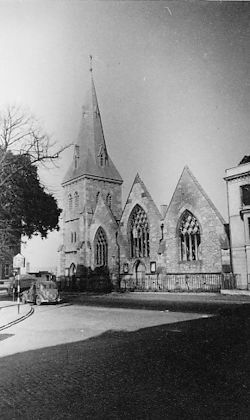 Saint Paul's Church was demolished by February 1958. * Kelly's directories quote September 22nd 1846. ** Navy Row later became Albert Road.